Entertaining during the holidays is such a tradition and nothing is more traditional than Clearly Susan's hand painted hand painted Christmas cake plates hand painted in holiday festive designs. 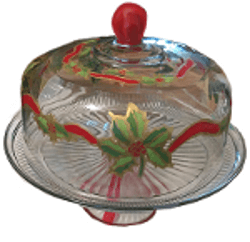 Our holiday cake plates are offered in a variety of styles and Christmas designs. 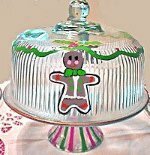 Our Christmas pedestal cake plates sit tall and pretty and will enhance your holiday table. What type of cakes do you create for the holiday season? Are they traditional cakes like red velvet, vanilla or chocolate or do you have some special recipe handed down from generations? Whatever you choose our Christmas cake plates will look beautiful on your dining room table or buffet.